282 pages | 25 B/W Illus. Inviting multiple ways of critically engaging with literature, this text offers a fresh perspective on how to integrate children’s literature into and across the curriculum in effective, purposeful ways. Structured around three "mantras" that build on each other—Enjoy; Dig deeply; Take action—the book is rich with real examples of teachers implementing critical pedagogy. The materials and practical strategies focus on issues that impact children’s lives, building from students’ personal experiences and cultural knowledge to using language to question the everyday world, analyze popular culture and media, understand how power relationships are socially constructed, and consider actions that can be taken to promote social justice. 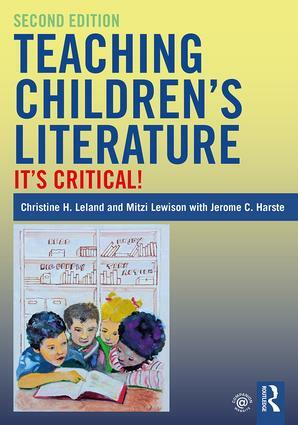 Written for teachers and teacher educators, each chapter opens with three elements that are closely linked: classroom vignettes showcasing the use of literature and inviting conversation; three key principles elaborating the main theme of the chapter and connecting theory with practice; and related research on the topics and their importance for curriculum. Other chapter features include key issues in implementation, suggestions for working with linguistically and culturally diverse students, alternative approaches to assessment, and suggestions for further reading. A companion website to enrich and extend the text includes an annotated bibliography of literature selections, suggested text sets, resources by chapter, and ideas for professional development. "If you are searching for a children’s literature text that speaks to issues beyond what is effective literature, this is the text that you should include in your teaching. Leland, Lewison and Harste have created a text that is practical and relies on sound research to provide a pathway to building connections with literature." "This text celebrates the potential of children’s literature to encourage readers to engage in the reading process, to think critically, to sort through ideas, and act on them. Theory and practice are grounded in pedagogy that puts the reader at the center of the process, enjoying the adventure with high quality literature across the curriculum." "Teaching Children’s Literature: It’s Critical! is a must read. The authors cleverly combine research, theory, and strategies that support classrooms filled with students who love reading, read critically, and use knowledge to advocate for equity." Chapter 1 Introduction: Enjoy! Dig Deeply! Take Action! Christine H. Leland is Professor of Literacy, Culture, and Language Education at Indiana University-Purdue University, Indianapolis, USA. Mitzi Lewison is Professor of Literacy, Culture, and Language Education at Indiana University, Bloomington, USA. Jerome C. Harste is Distinguished Professor Emeritus of Language, Literacy, and Culture at Indiana University, Bloomington, USA.